1. Place the avocado in a small bowl with the lime juice and gently mash with a fork. Stir through the coriander and lime zest (reserving a little zest to garnish). Season to taste with the salt. 2. Just before serving, roast or grill the bread slices. 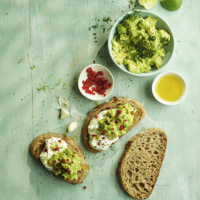 Rub the garlic over the toast and top each slice with a piece of burrata cheese, mashed avocado, chopped chilli, the reserved lime zest and a drizzle of olive oil. This recipe was first published in Wed Aug 26 11:38:00 BST 2015.